I was still organizing notes from my 4 day long visit of Cosmoprof (Italy), when almost on a whim I decided to attend The Makeup Show in New York City, held at the Metropolitan Pavillion in the Flat Iron district of Manhattan last Saturday and Sunday. The Makeup Show is one of the most celebrated makeup events in the world, taking place also in Los Angeles, Chicago, Dallas, Orlando and in Europe in 2015. This event may not be huge in terms of square footage if compared to other beauty trade shows, but it certainly packs an incredible amount of content, with multiple hands on workshops, business forums and seminars by some of the best contemporary artists covering the latest topics, a career orientation event and many other networking opportunities for both new and established Muas, not to mention the two floors where you can shop all the best brands at discounted prices. Airbrush makeup was undoubtedly one of the brightest stars of this event, with Temptu being a Platinum Sponsor. The seminar schedule on the first day started with a very interesting class by multi talented Kaye Tuckerman of Inglot Cosmetics called "Traditional application Vs Airbrush", giving airbrush newbies some very useful tips and ideas, and encouraging them to add airbrushing to their set of skills. 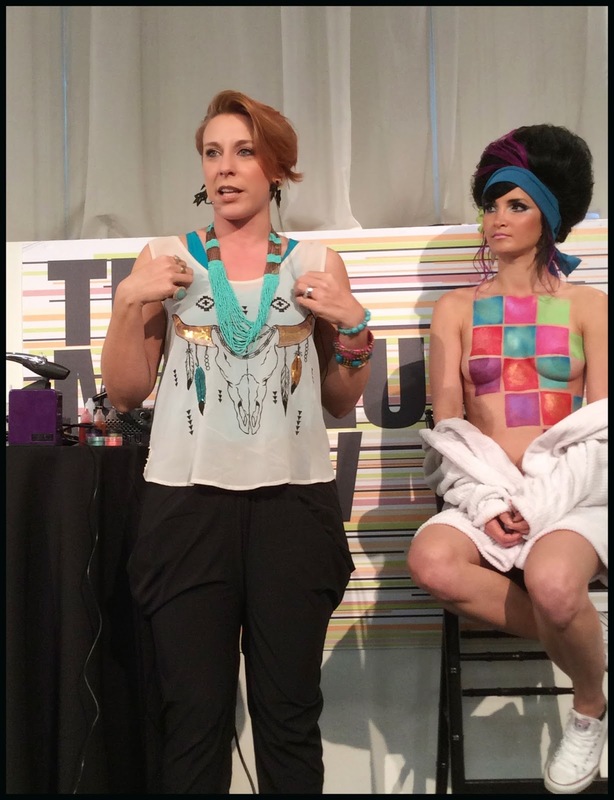 Later on Dani Fonseca for Temptu held another unmissable talk illustrating the potential of airbrushing beyond beauty makeup, on body painting, temporary tattoos and eve temporary body bronzing. Other beautiful demonstrations where held nearby at the Kett extensive booth, where the new Fixx Creme Correctors were being presented, and where I had the great pleasure of meeting the brand founder Sheila McKenna (and I nearly imploded with pride when she told me she is a reader of this blog). We are very excited to be featuring Sheila in our upcoming Airbrush Guru Profiles series. Just a few yards away from Kett I was finally able to meet in person with Eric Coffman and the team behind his legendary Graftobian brand, which will soon get an extensive review on these pages. Another brand also present on the first floor of the exhibition was elementwo, a new company based in Taiwan and Las Vegas whose product I look forward to trying. On the second floor I was excited to meet the lovely team behind Belloccio, the established brand for consumers that we will review in detail on these pages soon, and then again downstairs I was able to say hi to the makers of the excellent Nurturing Force line, and to pick up another couple of products for a future review. Amazing event! congrats for your partecipation! you have a great blog, nice post, good job!!! Un evento importante per lavori di tutto rispetto come i vostri, complimenti! complimenti per la vostra partecipazione..
What a wonderful event .. congrats for your partecipation!!! Congratulations on vs participation in such an important event ..